See the complete Pro event from the pump room to the prejudging, all the posing routines, exciting posedown and awards at the Finals. 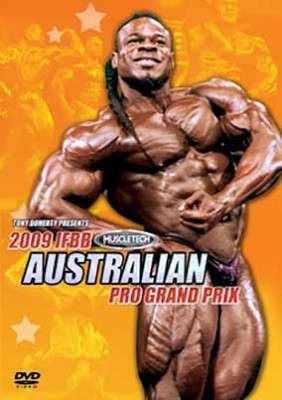 Plus guest posing by the top 3 amateur men at this the 9th Aussie Grand Prix staged by Tony Doherty. This was the best quality field of US stars ever seen at the Aussie GP. KAI GREENE had won the 2009 Arnold Classic a week before, and SILVIO SAMUEL had just won the 2009 Iron Man Pro a few weeks prior to that. These are two of the hottest physiques in the World having just won the opening 2 Pro Shows of 2009, along with X-Man TONEY FREEMAN. See the complete Pro event from the pump room to the prejudging, all the posing routines, exciting posedown and awards at the Finals including Kai’s victory speech. Plus guest posing by the top 3 amateur men at this the 9th Aussie Grand Prix staged by Tony Doherty. Another highlight was new Aussie Pro, formerly from Greece, MICHAEL KEFALANIOS, qualifying for the Olympia in his first Pro Show. This is quite a rare feat. Another big star in the making was Sydney’s own IVAN SADEK placing 5th, in his first Pro Show. Also of special note was the classical posing artistry and superb physique of RUSTY JEFFERS from USA. Rusty was most unlucky not to make top 6. This was the best quality field of US stars ever seen at the Aussie GP. KAI GREENE had won the 2009 Arnold Classic a week before, and SILVIO SAMUEL had just won the 2009 Iron Man Pro a few weeks prior to that. These are two of the hottest physiques in the World having just won the opening 2 Pro Shows of 2009, along with X-Man TONEY FREEMAN. What an amazing line-up. Many experts are tipping Kai to win the 2009 Mr. Olympia. He has won his last 3 Pro Shows, and is relatively new on the pro scene – see his contest history below. Other highlights of the DVD include Tony Doherty’s colourful introductions of each competitor before they do their 8 mandatory poses, the on-stage interview with LEE PRIEST who talks about his biceps injury, recent operation and planned return to bodybuilding and the amazing top 5 POSEDOWN where all of the guys went out into the audience. The lighting man followed them with a spotlight so that this exciting part of the event was well lit and perfectly captured by our camera. The event’s major sponsor was MUSCLETECH. Wayne’s HARD NEWS REPORT on the 2009 Australian Pro Grand Prix. Dallas Brooks Hall, Melbourne, March 14th, 2009. All photos by Gary Phillips garyphillipsphotography.com and Robert Szabo. Special thanks to Michael Buna who shot some of the Pump Room footage for me. Pump Room – 14 mins.